Opies black olives are the famous Hojiblanca ('white leaf' in Spanish) variety grown mainly in the Spanish provinces of Seville, Cordoba and northern Malaga. A highly prized olive that is harvested late in the season and is harder to pick as it rarely falls from the trees on its own. Sublime on their own or use them to make canapes - red pepper and black olive canapes or black olive butter to dress fish or steak. Ideal for cocktail snacks, garnishes for pizzas or salads. 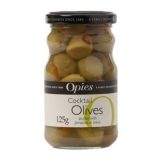 Perfect for whisking up a tapenade for nibbles. 227g of olives in brine. 95g of olives by drained weight. Olives, Water, Salt, Lactic Acid, Ferrous Gluconate. This product may contain undetected stones. This product is made in the factory where following allergens are handled: walnut, mustard, dairy, sulphites, celery, soya and egg. Once opened, keep refrigerated and use with in 1 month.